Are 3 Month Old Allergies Possible? Parents often don’t realize the signs of an allergy in newborns and babies. A runny nose is often thought to be a chronic cold. A skin rash is thought to be skin acne, while an upset stomach is thought to be only a delicate stomach. Yes, the above-mentioned symptoms are in general, a sign of a common cold or another passing ailment. However, they can also signify an allergy. Are 3 month old allergies possible? Can a 3 Month Old Have Allergies? Yes, allergies among 3 month old babies are possible. In general, these are allergies to mold, dust mite or pet dander. Due to constant exposure to the following allergens while indoors, the baby can develop an allergy at a very young age, even at 3 months old. Other allergies such as those to ragweed, commonly known as seasonal allergies are less likely to occur before the age of 1 or 2, as usually it takes some time for the baby to get exposed to these allergens. Identifying an allergy in babies can be quite challenging for new parents. Various symptoms occur, depending on the systems affected. Discoloration of the skin under the eyes, etc. Other signs and symptoms of an allergy include swollen lips, mouth and tongue, ear infections, etc. Allergic symptoms tend to be persistent. They appear and reappear based on the exposure to the specific allergen. If you notice symptoms of an allergy in your child, seek professional medical help. How Are Baby Allergies Diagnosed and Treated? When an allergy is suspected, an allergy test is necessary. An allergy test finds out specific allergens that your baby might be allergic to. A skin prick test consists in dropping specific allergens on your baby’s arm. In each drop, a tiny prick is made in order to check how the skin reacts to these allergen drops. Another way to detect 3 month old allergies is through a blood test. Blood tests are specific IgE tests which consist in measuring the amount of IgE antibodies in the blood. These antibodies have been produced by the immune system of your baby as a response to a specific allergen. 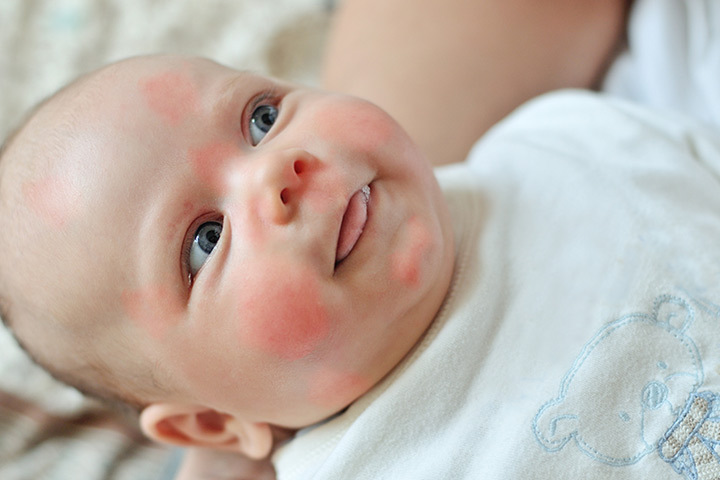 Whenever you think that your baby has an allergy, seek professional medical help. Don’t use commercial testing kits as it has not been proofed that these kits really work. You want just the best for your baby, don’t you? The best treatment possible is to keep your baby away from the allergen that is causing an allergic reaction in the first place. However, in most of the cases, this is impossible to do. Often, medications such as antihistamines and corticosteroids are recommended. These medications can’t cure the allergy, but they can help manage its signs and symptoms. For 3 month old allergies, many medications are not appropriate. Talk to your healthcare provider for any concern that you might have. Ask your healthcare provider what is the best solution for your baby when it comes to dealing with allergies. New allergy treatments are being studied. These treatments, known as immunotherapy or desensitization consist in exposing a person in tiny and increasing doses of an allergen. This kind of treatment is recommended for severe allergic reactions such as in cases of pet allergies or hay fever. The most common allergens are listed below. You need to work from the three aspects to prevent your baby from allergies. Dust mites are commonly found in every house, so it is impossible to avoid them. Children and babies are mostly exposed to dust mites in their bedrooms as they are commonly found in the mattresses and pillows. The following tips can help you minimize the exposure of your 3 months old baby to dust mites. Wash your baby’s bedding at least once a week in hot water. This way the dust mites will get killed. Encase the mattress of your baby’s bed into a tightly woven fabric impenetrable cover. These covers will work as a barrier for dust mites. Use blankets instead of big and fluffy comforters as well. Vacuum and dust the baby’s room at least once a week. However, make sure that your child is not in the room while you are cleaning. Wet mopping is also necessary as it will prevent dust- mite particles from being in the room. Buy a vacuum cleaner with HEPA-filter if possible. HEPA-filters trap every microscopic particle which can pass into the air when using ordinary vacuum cleaners. Replace your carpet floor with vinyl or hardwood. Clean and replace the filters of your air conditioner every month if you are using them. Make sure to clean the heating ducts as well, every fall before the winter season comes. Don’t pile up stuffed animals in your baby’s room. Make sure to wash your child’s favorite toys in hot water every week. You can also put them in the freezer overnight so the dust mites will get killed by the frost. Mold is commonly found in every house, especially in the basements and bathrooms. Molds are also commonly found growing under carpets, garbage cans, attics, cellars, closets, refrigerators, shower stalls, etc. Make sure to clean your bathroom regularly with mold-inhibiting disinfectants. Natural mold-inhibiting disinfectants are water and tea tree oil. Get a better ventilation system if possible. 3 month old allergies against pet dander can be easily managed by giving the animal away if you own one. However, for many parents, this is not an easy decision to make. Normally, you would want to check for any other possible solution first. To keep your pet dander down, make sure to wash your pet at least once a week. In pet stores, look for pet dander reducing shampoos. Keep your pet away from your child’s room. Can You Be Allergic to Weed?